This post is no longer being updated but more tomorrow as the big freeze continues. The snowfall is over, maybe the occasional flurry. But the packed snow and ice will be with us for some days. The BBC is suggesting temperatures as low as -11C tonight. Stay safe. Stay warm. Please check on your neighbours. All schools in the area are closed on Monday and other services are disrupted. I’ll update this as news comes in. Non-stop updates on BBC Radio Shropshire from 6am. @shropcouncil is tweeting like mad, putting out more than 150 tweets yesterday alone. If there is any message you want to get out, let me know. Buses. A basic service will be provided running along the major roads in Ludlow and serving the GP practices, hospital and pharmacies, along with the supermarkets. It is unlikely that any estates will be served today by the 722, including areas such as Tollgate, Rocks Green and the Eco Park. The 701 is having to drop out some streets due to snow. The 435 between Ludlow and Shrewsbury will run along the A49 only and will not serve villages on the two loops on country lanes through Wistanstow and Condover. Bins. 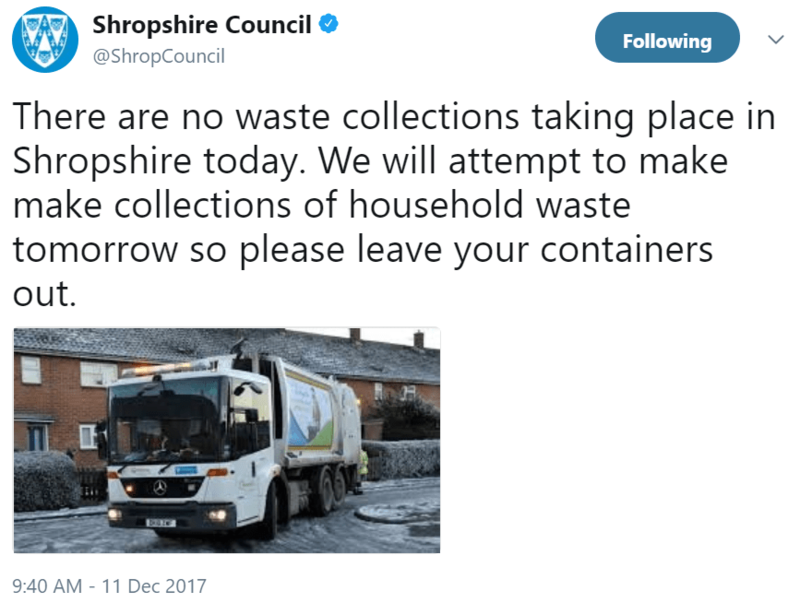 A late call by Shropshire Council. There will no waste collections in Shropshire today. Veolia hopes to collect tomorrow. Medical services. Shropshire Community Health Care Trust says all outpatient services in the county’s community hospitals are cancelled on Monday. Ludlow’s minor injury unit is shut on Monday. GPs. Portcullis Surgery is running a skeleton service, so essential appointments only. The doctors are also warning people that the snow and ice in the area is dangerous. All partners are in at Station Drive Surgery. Any patients needing medical care but can’t get in today should ring the surgery. Ludlow Town Council‘s meeting tonight is cancelled. Shropshire Council will be running on a skeleton staff. It will still be providing essential services. It has instigated its Business Continuity Plan. That’s designed to keep the council operating in emergencies. The customer service point in Ludlow Library will be closed. Ludlow Education Centre will be closed. All committee and public meetings in Shirehall today are cancelled. Neighbours. I don’t think I need to say this in Ludlow but it’s a good time to call on your neighbours if they are elderly, infirm or vulnerable. Routine matters like picking up prescriptions and other essentials get hard in weather like this. Keeping warm. It is easy to forget that some people live in properties that are hard to heat or they are so broke they can’t afford the heating. Advice on keeping warm has been issued by Age UK and NHS England (the Age UK advice is more practical). Gritting. Shropshire Council has an online map showing gritting routes. This seems to show only the minimum area gritted and other roads have already been covered in Ludlow. The teams are working around the clock distributing around 1,200 tonnes of grit a day. That’s nearly 10% of the stock daily. Side streets and country roads are unlikely to be gritted or cleared today. Residents should use the grit in the yellow boxes to improve grip on paths and roads.